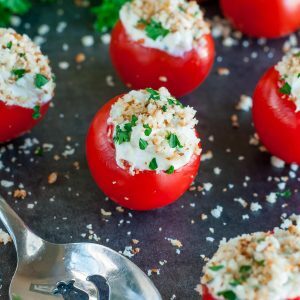 These 6-ingredient herbed Goat Cheese Stuffed Tomatoes are healthy, delicious, and a total breeze to throw together. Run the knife along the inside of the tomato in a circular motion to release the inside, then scoop out with your index finger to remove the seeds and such and create a little bowl. Next toast your panko. Bring a skillet to medium high heat with a drizzle of oil. Add panko and toast until golden, stirring frequently for about 1-2 minutes. Combine goat cheese, honey, green onion, parsley, and mix well. Spoon a dollop into each tomato. You can also add the filling to a piping bag or plastic bag with the edge cut off and pipe the filling into the tomatoes <-- this method is super speedy if you're making a bunch! Top with panko and garnish the tray with some extra parsley for a burst of color. Campari tomatoes are between a cherry and plum tomato in size, perfect for stuffing and an easy peasy bite-sized snack! If using cherry tomatoes, you'll need a few extra. If using plum or roma tomatoes, slice each tomato in half before stuffing and you'll use approx. 3 for this recipe. Double, triple, and quadruple the recipe as needed to feed a crowd! Not a fan of goat cheese? Don't fret! Try 'em with cream cheese. Stuffed tomatoes may be made in advance and kept in the fridge, minus the panko itself. Toast your panko and store, tightly wrapped, at room temperature, then add before serving. Nutrition Facts are an estimate gathered using an online recipe nutrition calculator.